Whether it is an American muscle car or a foreign exotic, racers choose ethanol over all other fuels. This isn’t your daddy’s speed circus, kids – as in 84-year-old “Big Daddy” Don Garlits, considered to be the father of drag racing and who used nitromethane (a fuel that combines propane and nitric acid) to first surpass 170 miles per hour in a funny car. Oh, no kids, far from it. This is Shift S3ctor, which began in 2011 as the first-of-its kind organization to bring side-by-side roll racing events to the West Coast. Born out of the outlaw need for speed, mainly not-so-legal street drag racing – Shift S3ctor created its “Airship Attack,” a series of half-mile drag racing events utilizing airport runways that is an invitation for anyone to test their mettle (and metal) against the fastest machines in the world. Side-by-side. 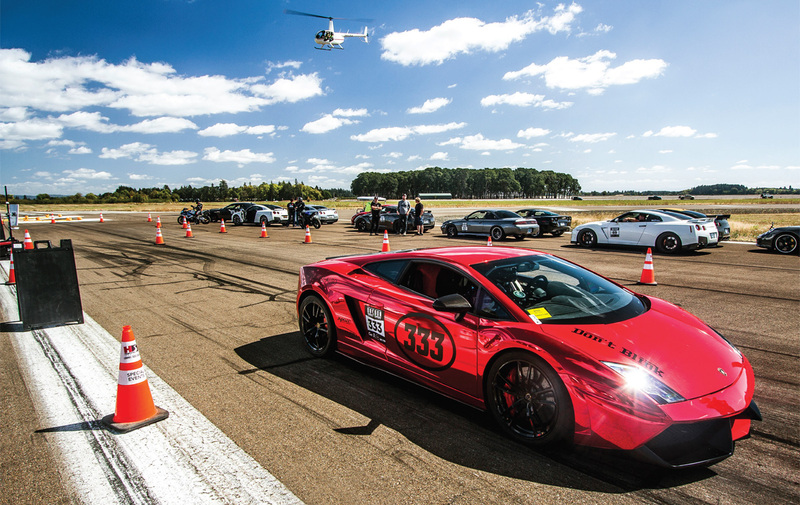 Whether it be a big American Chevy Camaro muscle car, or a foreign exotic – like an Italian-made Lamborghini – these folks are pushing the envelope of speed. And fueling all this ruckus is clean-burning, American-made ethanol. What’s that, you say? Ethanol – like the E85 they sell at the gas station? Huang said a chance encounter with Jay Berry and Ignite Racing Fuels actually cemented his belief in ethanol as a race fuel, and as a fuel for the general public. American Ethanol Racing is a collaborative partnership, which highlights the reliability, affordability and the performance capabilities with ethanol. Since 2011, American Ethanol has created partnerships with NASCAR and Ignite Racing Fuel to further ethanol’s reach into the sport. That, in turn, has helped owners and drivers in other racing disciplines – like boating, drifting and yes, drag racing – really see what ethanol can do for performance. “That difference is ethanol,” he added. Word of mouth is growing. When Growth Energy launched its partnership with NASCAR in 2011, research into its fan base revealed that about 50 percent of NASCAR fans were supportive of ethanol in their vehicles, according to Kelly Manning, Vice President of Development for Growth Energy. Today, the same research indicates that number has grown to 80 percent acceptance. Shift S3ctor’s other co-founder, Ryan Fisher, and Shift S3tor event coordinator, Chris Bennett, echo Manning’s assessment that ethanol is making a huge impact in drag racing. And they’re seeing the fans’ support of the fuel, by seeing what ethanol brings to racing engines, and are willing to try it in their own vehicles. “So ethanol has really jumped into the scene in the last couple of years,” Fisher said. “The top performers are using it and the little guy can go buy into it, too,” Bennett said. So let’s shift away from organizers and the industry guys, and talk directly to drivers who run ethanol in a high-performance drag racing vehicle. Like Las Vegas natives Anthony Taylor and his fiancé, Adria Abkar. In 2015 Taylor set the half-mile speed record for a Porsche, clocking 219.30 miles per hour in his Porsche EVT 1700 997 Turbo. Abkar drives a Nissan GT-R – also fueled by ethanol. Let’s just pause right here and ask Taylor – what’s it feel like to drive a vehicle at 219.30 miles per hour down a half-mile straightaway? So race fans – should the American consumer run an ethanol blend in their passenger vehicles? “I think the product sells itself,” Shift S3ctor’s Fisher said. “It’s cleaner, it produces power, it’s efficient, it’s sustainable – there’s so many great things about it. If more people knew that, then they would jump onboard. It’s just getting the message out to guys like us – racers to car guys that are the ones tinkering, building cars and if you do a side-by-side comparison, there’s no question.